Many of you may be planning a winter proposal due to the upcoming holidays. The holiday season is the most popular time for marriage proposals because the holidays are a time of reflection and thankfulness, with the days mostly being spent with those that we love, such as family. deBebians carries a large collection of engagement rings, including halo engagement rings with cushion cut morganite center stones. The warmth of the gorgeous gemstones will surely melt her heart this holiday season. If you are interested in learning more about a particular design seen below, you may click on the link or the photo to be taken to the product page. Each of these engagement rings is available in your choice of precious metal (14 karat gold, 18 karat gold, palladium, or platinum) and finger size (whole, half, and quarter finger sizes available). 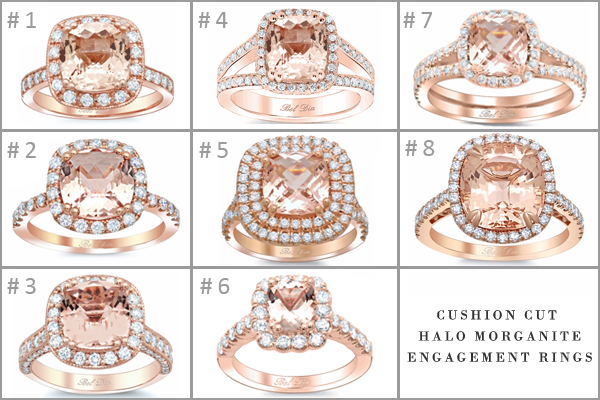 The rings are designed with a diamond halo, which adds sparkle and complements the peachy pink hue of the center stone. With diamond prices continuing to rise, morganite is a beautiful and affordable alternative.